Earlier this year, renowned choreographer and former Strictly Come Dancing judge, Arlene Phillips noticed a problem with her hearing. Following a hearing test, the 75-year-old dancer now has two hearing aids and admits it wasn’t until she got them that she realised just how much she had been missing. Specsavers research shows that 52% of UK adults worry that they are losing their hearing – with a third saying they would rather miss out on conversations than admit they can’t hear. Arlene is encouraging people to have regular hearing checks to coincide with the launch of the Signia Styletto – a stylish and discreet new hearing device available at Specsavers stores. When did you notice you had a problem with your hearing? ‘I was in Germany working on a new production of Starlight Express. There’s a lot of dialogue, a lot of music and some big rock ’n’ roll numbers. I seemed to be missing elements of what was happening on stage. I wondered if I’d asked for the volume to be turned up too loud or if some of the sounds were being drowned out by other noises. What was it like wearing hearing aids for the first time? What advice would you give to people struggling with their hearing? 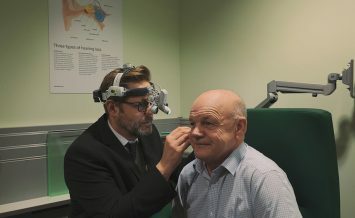 Specsavers recommends that those over the age of 55 should have their hearing checked every two years, and if you are concerned about your hearing make an appointment to see your Specsavers audiologist.